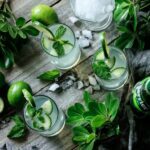 Easy lime and mint refresher is a non alcoholic beverage made with lime juice, simple syrup, mint syrup, and sparkling mineral water. It’s an easy drink recipe that will please guests at a summer party, Easter brunch, or baby shower. Spring is a special season–a time of rejuvenation after a long, cold winter. It’s so exciting to see the blossoming flowers, and the budding green leaves. The twittering birds flutter in the spring breeze, and rabbits and squirrels frisk on the green lawn. 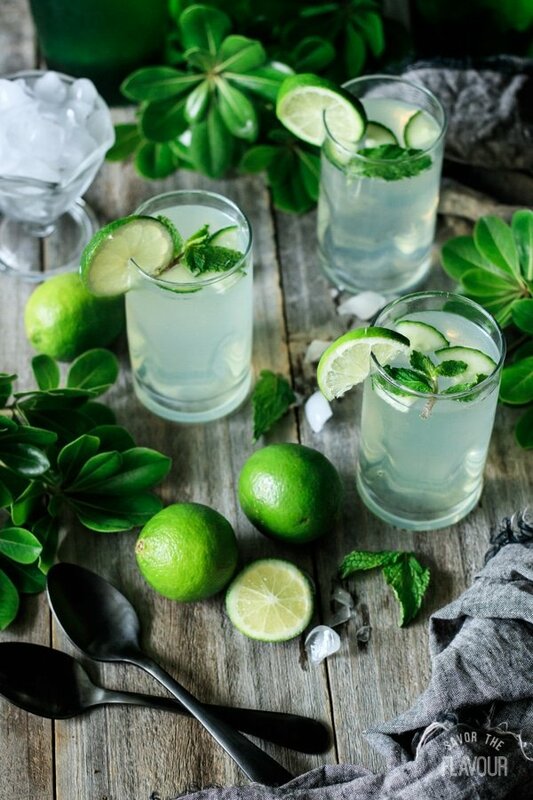 With the world turning green, it makes me want to eat and drink some spring food, like this easy lime and mint refresher. 🌺🌿 Hey, it doesn’t have to be St. Patrick’s Day for us to enjoy something green! One of the great things about this drink is that all the ingredients can be kept in the fridge or on the counter until they’re needed, so you can whip up a drink whenever you’d like. 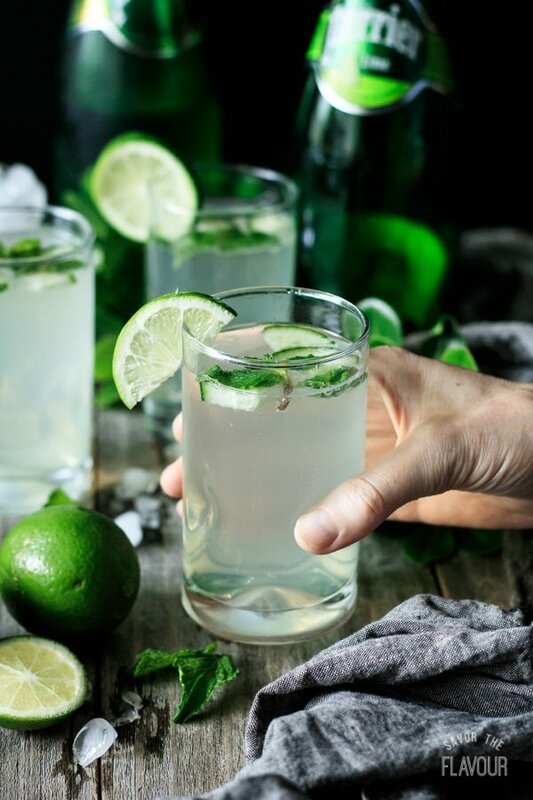 It makes this lime and mint refresher just the thing to serve for company. Liking this recipe? Check out these other refreshing drinks you need to try. 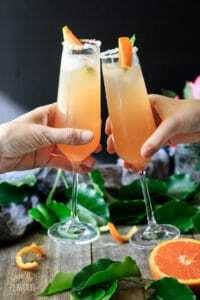 Sparkling Grapefruit and Ginger Fizz: a fantastic spring drink with a sophisticated flavor. 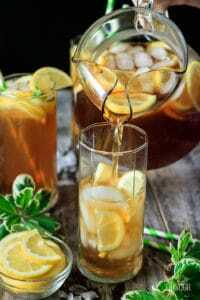 Arnold Palmer Drink: a delicious medley of lemonade and Southern sweet tea. Orange Julius: this super-easy drink is sure to become a family favorite–especially because it is ready in 10 minutes! Pour the sugar and water into a medium saucepan and stir together over medium heat until the sugar has dissolved. Bring the mixture to a simmer, then pour into a glass measuring jug with a spout and let it chill in the fridge until it’s cooled off. 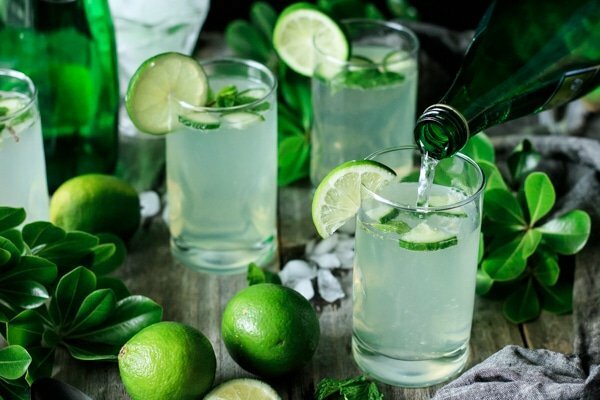 For each glass, combine 1/4 cup simple syrup, 1 tablespoon lime juice, and 1 tablespoon mint syrup in the glass, then top with about 2/3 cup of sparkling mineral water. Squeeze a little fresh lime juice from one lime wedge into the glass and stir gently to combine. Garnish with a thin slice of cucumber cut into fourths and a sprig of fresh mint. Place a slice of lime on the rim of the glass and serve immediately. This recipe makes enough simple syrup for about 9 drinks. It keeps well in the fridge for about a week. If you want to increase the lime flavor, put 2 tablespoons of simple syrup and 2 tablespoons of lime juice. Disclaimer: this post is not sponsored by Perrier, nor have we received any of their products for free for this post.